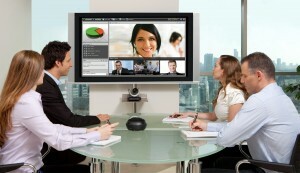 As the distinction between information and communication technology blurs, and the pressure to cut costs increases, video-conferencing is becoming more and more popular. Co-workers are now able to participate in video- and tele- conferencing without making any special preparations or adding any new pieces of equipment to their desktop. This is a subtly new way of operating and it requires some thought about the etiquette that could be applied to ensure that this form of communication has credibility, trust and effectiveness. Much of the etiquette is similar to tele-conferencing.